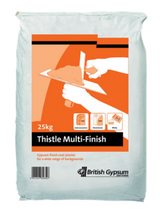 At Sydenhams we stock a wide range of plasters for most building purposes, manufactured by British Gypsum. We supply most plaster products required for wall and board finishes. Theses products are kept mainly in 25kg bags and are kept by most of our branches. Thistle Multi-Finish Plaster - This versatile final coat plaster provides good results on all suction backgrounds, and is therefore the best choice for use over both undercoats and plasterboard. It is also ideal for small jobs and patching. Coverage: 10m2 per bag based on 2mm thickness. 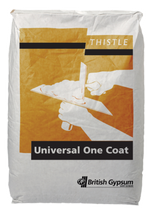 Thistle Universal One Coat Plaster - For a variety of backgrounds. Suitable for application by hand or mechanical plastering machine. Coverage: 2.25m2 per bag based on 13mm thickness. 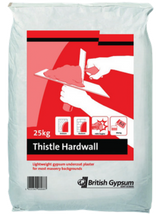 Thistle Hardwall Plaster - High impact resistance and quicker drying surface. Suitable for application by hand, or mechanical plastering machine, to most masonry backgrounds. Coverage: 3.0m2 per bag based on 11mm thickness. 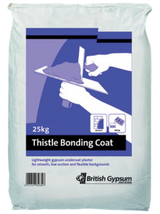 Thistle Bonding Coat - For low suction backgrounds such as concrete, plasterboard or surfaces treated with Thistle Bond-It. Coverage: 2.75m2 per bag based on 11mm thickness. 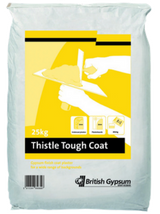 Thistle Toughcoat Plaster - High coverage, good impact resistance. Suitable for application by hand, or mechanical plastering machine, to most masonry backgrounds. Coverage: 3.5m2 per bag based on 11mm thickness. 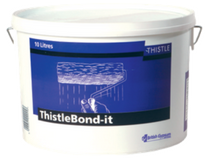 Thistle Bond-It 10ltr Tub - Bonding agent for smooth and / or low-suction backgrounds. Applied in one coat, by roller or brush, and plastered when dry. Green in colour to aid identifying treated areas. Contains aggregate particles to provide a mechanical key in addition to a chemical key.